Over the past few weeks, I have been working on a collection of architectural plans on tracing paper. These are often in fairly bad condition due to the inherent fragility of the paper. Papers from the 19th and early 20th century were made transparent by either impregnating the paper with oils (such as linseed or poppy), treating them with a strong acid, or by over beating the fibres. These manufacturing processes result in a weak paper sheet that is at high risk of tearing and creasing. 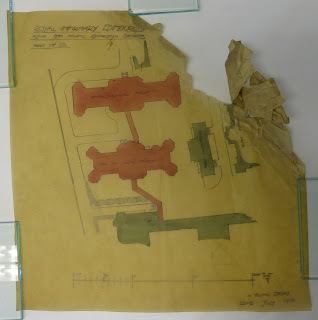 Architectural plan on tracing paper, before treatment. Shows extensive tearing and creasing. The treatment of tracing paper is complex. Most tracing papers are very sensitive to moisture, which means that traditional paper repair techniques such as using wheat starch paste and strips of Japanese paper are not suitable, as the repair is too damp. Also, due to the transparent nature of the tracing paper, these kind of repairs can be highly visible and distracting. There are a range of alternative repair techniques available to stabilise tracing paper such as using a heat set tissue with a synthetic adhesive or preparing remoistenable tissues with adhesives such as Klucel G (which uses a solvent to reactivate the adhesive) and isinglass and Japanese paper. I decided against these methods as the heat set tissue tends to not create a strong bond and may fail. I was also cautious of using Klucel G and solvents, due to the effect it may have on the oils in the paper. Isinglass is slightly trickier to handle as it must be kept warm whilst in use, but must not exceed a temperature of 60°C, otherwise its adhesive properties are reduced. 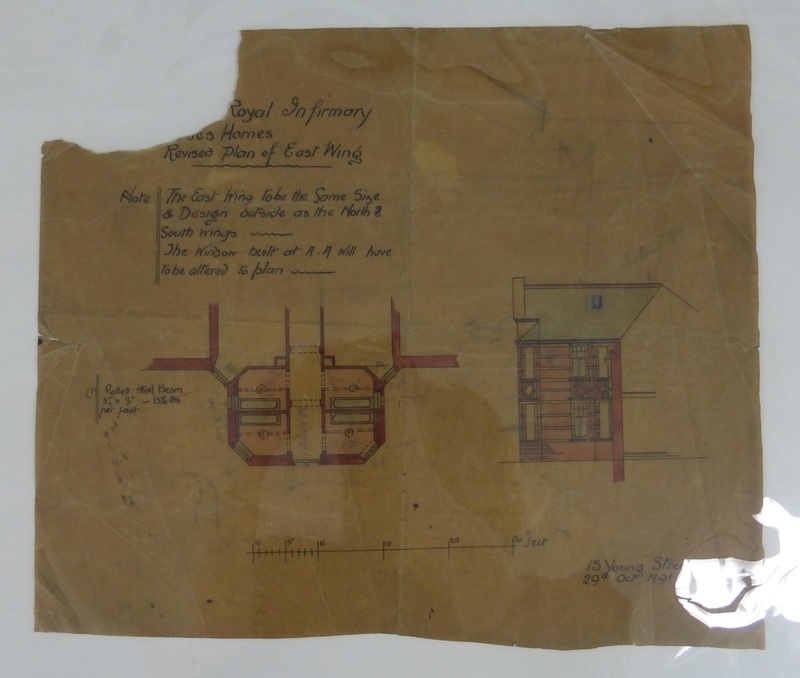 Architectural plan on tracing paper, before treatment. I wanted a repair technique that I could prepare relatively quickly and would stabilise the tracing paper, without being visible from the recto. I decided to use a bridge repair method that involves taking individual fibres from Japanese tissue and adhering each end across the tear with wheat starch paste. To do this I ripped up a small piece of Japanese paper and soaked it in water. I then drew out individual strands using tweezers and dried them on a glass weight, before cutting them to size with a scalpel. I then adhered these fibres across the tear with a dot of wheat starch paste at each end. I then pressed these locally under Bondina™, blotter and weights and left them to dry. Architectural plan on tracing paper, after treatment. Architectural plan on tracing paper, after treatment. Detail of verso showing bridge repair. This repair creates a surprisingly strong bond, which quick and easy to carry out while being sympathetic to the material. The plans are now much easy to access and view. Architectural plan on tracing paper, after treatment. Rehoused in a polyester sleeve. Project Cataloguing Archivist, Clair, shares a her final blog with us before she goes on maternity leave. This is my last blog for a while, as well as my last day before I go off on maternity leave! But before I go I thought I would take one last chance to explore some the unique collections that we hold at LHSA, as I will definitely miss being surrounded by all things old when my bundle of all things new arrives! 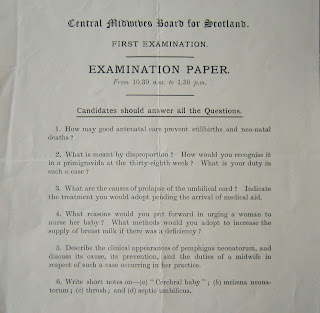 I could not resist taking a look at the midwifery records that we hold and reading more about the history of the development of maternity provision over the last 200 years in Edinburgh. From the LHSA website and past blogs you can also read further about the establishment of maternity hospitals in the city, as well as their related records that LHSA hold, here. 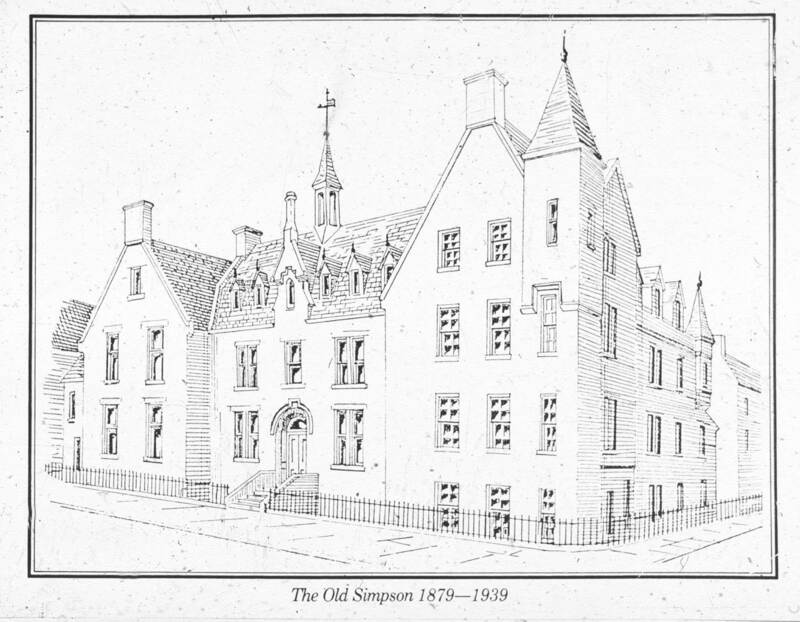 Briefly, the first planned maternity hospital, Edinburgh Royal Maternity Hospital and Simpson Memorial Maternity Pavilion, opened in 1879 which was the fist purpose-build maternity hospital, where women could have their babies under medical supervision in hospital. Care was also provided from hospital staff for at home deliveries. The Hospital was staffed by physicians as well as midwives and medical students, since t﻿﻿﻿﻿﻿﻿he 1886 Amendment to the Medical Act made midwifery a compulsory course in the medical curriculum. By 1910 the Hospital was dealing annually with 616 indoor and 1227 district cases. As the twentieth century progressed efforts were continuing to be made to combat maternal deaths, pregnancy illness such as eclampsia and infant mortality. 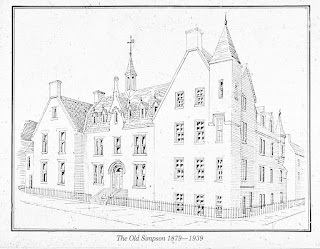 On 1st March 1939 the old Simpson closed and the Simpson Memorial Maternity Pavilion, which was incorporated into the RIE, assumed responsibility for maternity services. In the new Pavilion the principle of isolation as a means of containing infection was fully implemented and by 1979 the number of beds had increased to 225 while the hazards of childbirth and perinatal mortality had been drastically reduced. 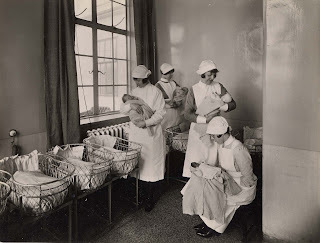 Nursery in the Elsie Ingles Memorial Maternity Hospital, c1930s (LHB8A/9). Another famous Edinburgh hospital that became responsible for maternity care throughout the twentieth century was the Elsie Ingles Memorial Maternity Hospital. This hospital was set up to commemoration Dr Elise Inglis and her pioneering work for women's medical care as well as her work in setting up the Scottish Women's Hospital units. They provided medical assistance in countries such as France and Serbia during World War One. The establishment of such hospitals enabled maternity care to improve and develop within Edinburgh but what of those that actually worked in maternity provision and took on the role of midwife? 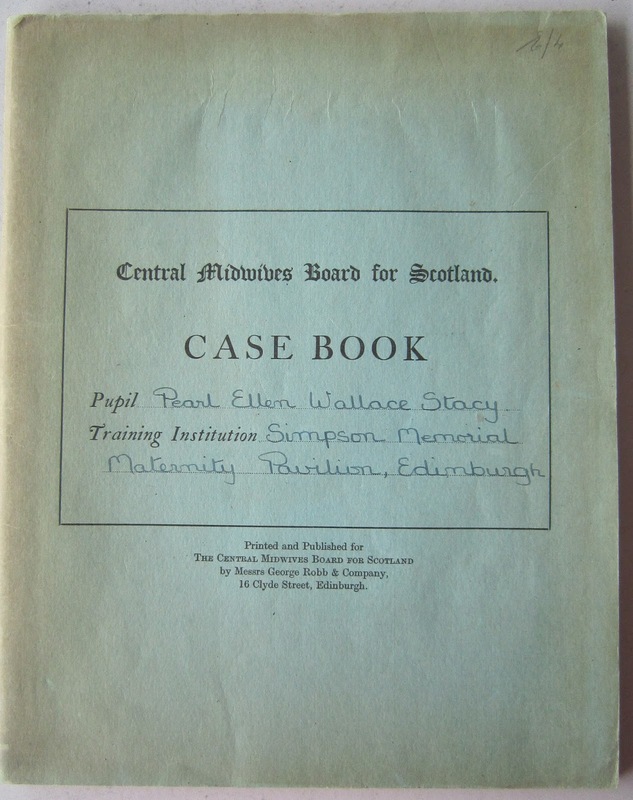 Amongst the gift and deposit collections that we hold at LHSA, we are lucky enough to also have personal collections of those that served in Edinburgh's maternity hospitals. They provide a fascinating insight into midwifery training and education. The following photographs come from GD1/131, the papers of Midwife, Pearl Stacy. She was a student of midwifery at the Simpson Memorial Maternity Pavilion from 1July 1944 to 1July 1945. She went on to have a career in midwifery and health visiting in the London Borough of Richmond until her retirement in 1977. 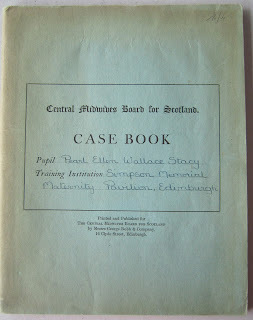 This was the Central Midwives Board for Scotland Case Book which Stacy used to record details of patient and child, as well as provide her own review of the case. 1945 (GD1/131/2). Above is Stacy's workbook which includes beautifully illustrated handwritten lecture notes. These were divided into different parts of her midwifery education, including anatomy, pregnancy, labour, peurperium, baby and mechanisms. 1944-1945 (GD1/131/1). 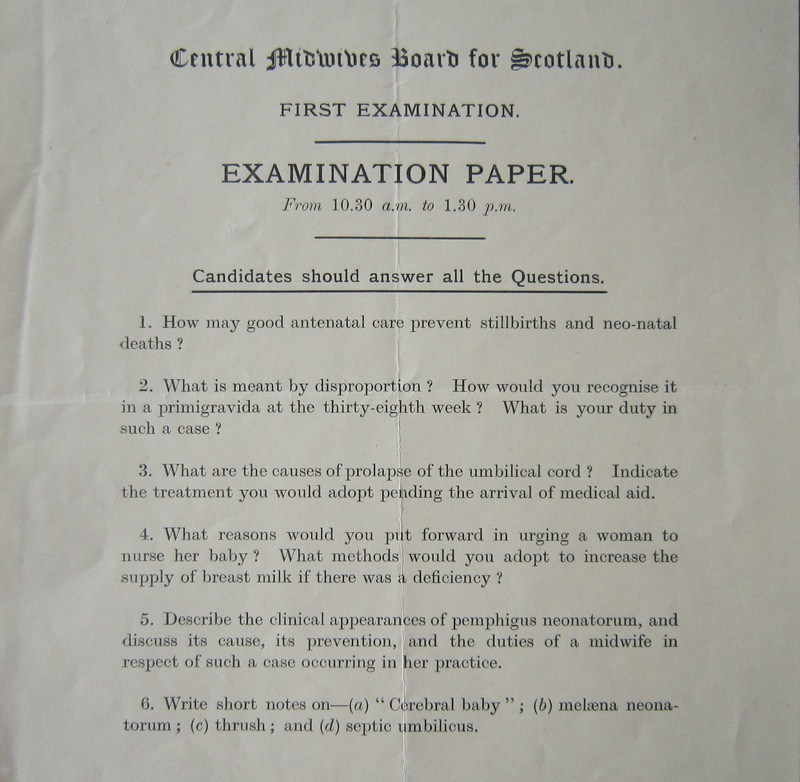 This is the Central Midwives Board for Scotland Examination Paper. c.1944-1945 (GD1/131/4). The questions examine the student on both medical and ethical decision-making. 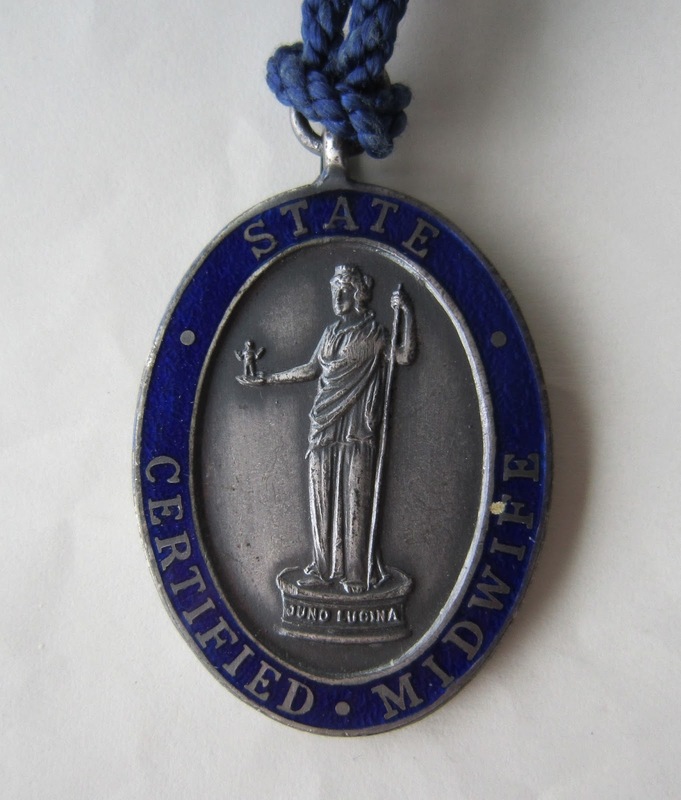 Finally, here is Stacy's State Certified Midwife medal engraved with PEW Stacy on reverse. Over the last year with LHSA, I have had the privilege of exploring and working with different historical collections from many areas of medicine and health provision. 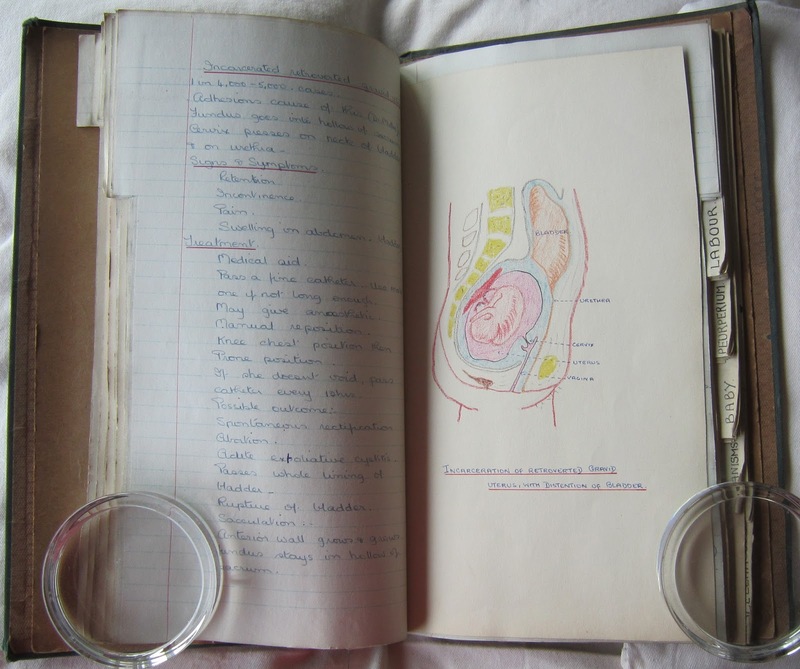 From our HIV/AIDS collections, to Norman Dott's Neurosurgical case notes and to catching a glimpse into personal collections such as the above, I will miss them as much as my lovely colleagues whist on maternity leave! 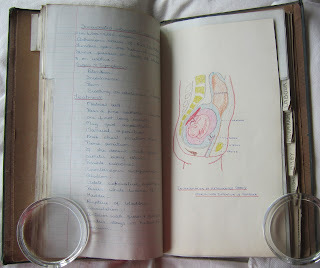 In my previous post I introduced this project, which will catalogue the case notes from the Royal Victoria Hospital. 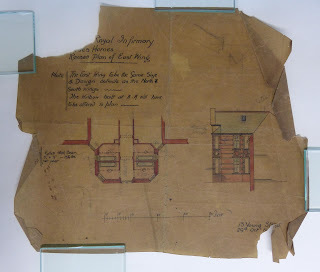 In this post I’m going to look at the history of tuberculosis and the development of the Royal Victoria Hospital, which will explain a bit about the context of the case notes. In 1881, prior to the opening of the Royal Victoria Hospital, tuberculosis was responsible for 306 in every 100,000 deaths in Scotland. 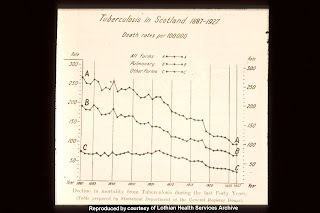 By 1919 this had fallen to 130 deaths per 100,000, and by 1958 only 13 in every 100,000 deaths in Scotland were caused by tuberculosis. Tuberculosis is spread by the sneezes, coughs or spit of an infected person. The bacteria can remain in the body for years without causing illness, a condition which is known as latent tuberculosis. The majority of active tuberculosis cases occur in the lung, which is why the common perception of tuberculosis is as a lung disease. However, once infected the bacteria can spread throughout the body causing tuberculosis of basically any organ you can think of. Case notes here include many cases of tuberculosis of the spine, abdomen, and lymph nodes, to name only a few. The bacteria which causes tuberculosis was discovered in 1882, though this did not lead to the immediate discovery of a cure. Developments in tuberculosis treatment throughout the nineteenth century were mostly based on trying the effectiveness of different climates, from the heat of Madeira to the Alpine air of Switzerland. 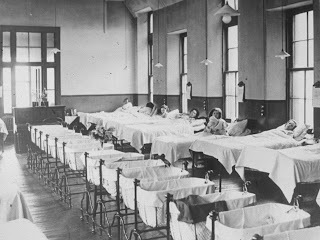 Within Britain, specialist hospitals for tuberculosis sufferers were established, and by the turn of the century a move towards the sanatorium model saw patients treated with total bed rest followed by a progressive increase in activity in large, airy buildings with plenty of light. Surgical treatment to collapse the infected lung rose in popularity between the wars, along with other methods of treatment with doubtful efficiency, such as injections with an extract from the tuberculosis bacteria (tuberculin). These methods were used up until the discovery of streptomycin and other antibiotics in the 1940-1950s, which led to a rapid decline in the mortality of tuberculosis. In Edinburgh in the late 1880s celebrated physician Sir Robert Philip pioneered a scheme, known as the Edinburgh Scheme, which took a three-strand approach to tackling tuberculosis through prevention, detection, and treatment. In 1887 he opened the Royal Victoria Dispensary in Bank Street, the first of its kind in the world. The dispensary became the cornerstone of the Edinburgh Scheme. Sufferers would report there for examination of their symptoms, when full details of their case history would be taken and patients would be instructed in how to avoid spreading the disease. The patient’s contacts would be identified and examined in order to catch the disease in its earlier, more treatable stages. Health visitors and medical officers would visit the patient’s home and check on living conditions, providing information on disinfection of the home. 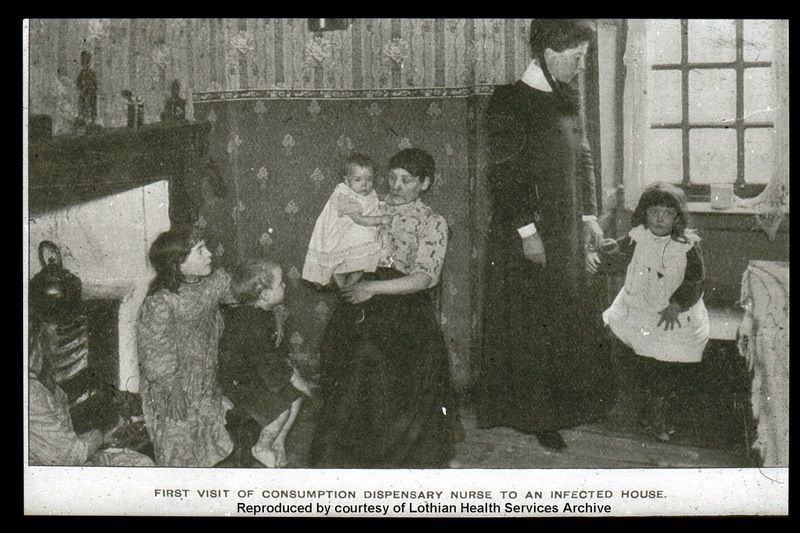 Several other institutions provided treatment as part of the Edinburgh Scheme. Philip opened the Royal Victoria Hospital in Craigleith in the 1890s, with 76 beds. Patients could be sent there from the Dispensary for x-rays and treatment at the direction of the tuberculosis officer for Edinburgh. The Royal Victoria Hospital Trust also managed a voluntary institution at Southfield Sanatorium in Liberton, founded in 1914, which admitted patients with all forms of tuberculosis to its 96 beds. Scottish local authorities from outwith Edinburgh could send patients there for a standard fee if they lacked treatment facilities. Patients could also be admitted on the agreement that they were responsible for their own fees, which they were charged according to their means. Polton Farm Colony provided work for recovering or cured patients in an environment which was suitable for their health. Together, these institutions could provide treatment for tuberculosis sufferers at all stages of the disease. 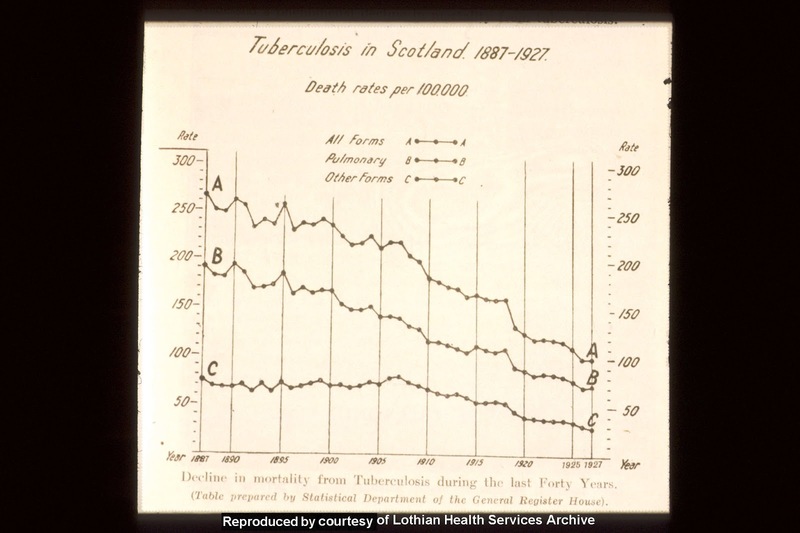 The success of the scheme, reflected in the declining mortality rates highlighted at the beginning of this piece, inspired the legislative drive towards the notification of tuberculosis throughout the UK. Local authorities were ‘notified’ of infectious persons in their area, in order that a Medical Officer could examine the patient and check that they were receiving the treatment to which they were legally entitled. In this way, Sir Robert Philip and the Royal Victoria Hospital can be seen to have influenced tuberculosis treatment throughout the UK in the early twentieth century. The case notes which form the bulk of this project come from the Dispensary and Southfield Sanatorium. Not only do they show us the background, symptoms and treatment of patients, but they also provide an insight into how this influential scheme worked in practice. 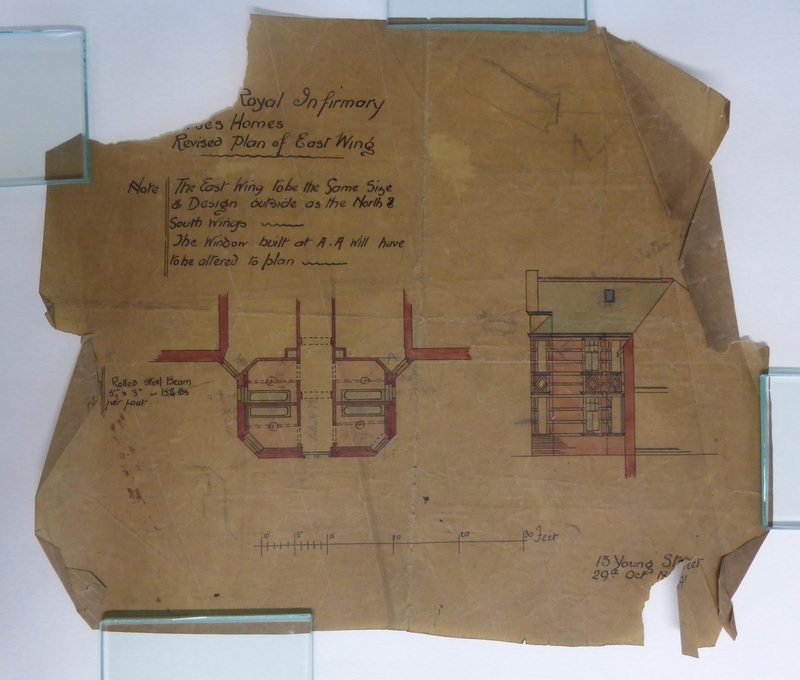 In this week’s blog we hear from Ruth, who was at the Archives and Records Association (ARA) annual conference in Dublin last week. I may not have seen much of Dublin, having barely left the conference venue, but the packed programme certainly made up for it! Speakers from all over the world contributed to the overall theme of the conference, that of the moral and legal obligations of the archivist - an area of particular relevance to us at LHSA as custodians of health-related collections that are so often confidential. I was very interested to hear about the research use of mental health records in Ireland and see how the legislation and atmosphere there differs from that here in Scotland. There was also a couple of papers that really opened my eyes to the issues and complexities around large-scale digitisation projects – not just what could or should be put online, but also the extensive work that’s required to prepare the physical collections for the digitisation process itself. I was also presenting at the conference as I had a paper accepted on our internship programme for newly-qualified archivists and conservators. I described what we offer and why, and discussed some of the pros and cons of the programme. My aim was to focus on practicalities as much as possible so that if anyone attending was thinking about doing something similar they could see exactly how we manage the programme and how it might work in their own organisation. And I was in good company, Head of Special Collections, Joe, was also at the conference as was Paul, our Skills for the Future trainee (who blogged about his time with LHSA last week). 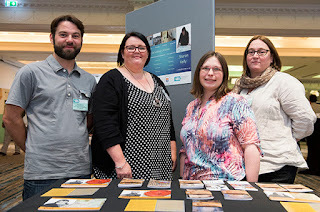 Paul was there with his fellow trainees and promoted both the Centre for Research Collections and LHSA in the information marketplace, in particular highlighting our case note cataloguing projects and discussing our recent cataloguing and conservation work for our HIV/AIDS collections. All in all, a successful conference – well organised, informative and with plenty of opportunities to make useful contacts, as well as offering us the chance to highlight our work to colleagues across our sector. If you’d like more info about the conference, there are abstracts of a number of talks and lots of photos on the ARA website at: http://www.archives.org.uk/ara-in-action/the-ara-conference.html?showall=&limitstart=.